Radiological evaluation of airway – What an anaesthesiologist needs to know! Airway management forms the foundation of any anaesthetic management. However, unanticipated difficult airway (DA) and its sequelae continue to dread any anaesthesiologist. In spite of development of various clinical parameters to judge DA, no single parameter has proved to be accurate in predicting it. Radiological evaluation may help assess the aspects of patient's airway not visualised through the naked eye. Starting from traditional roentgenogram to ultramodern three-dimensional printing, imaging may assist the anaesthesiologists in predicting DA and formulate plan for its management. Right from predicting DA, it has been used for estimating endotracheal tube sizes, assessing airway pathologies in paediatric patients and planning extubation strategies. This article attempts to provide exhaustive overview on radiological parameters which can be utilised by anaesthesiologists for prediction of DA. Airway management is of prime importance to an anaesthesiologist. Encountering an unanticipated difficult airway (DA) is not an uncommon scenario. It poses potentially life-threatening problems. The American Society of Anesthesiologists' Closed Claims Project has reported that two-thirds of all the claimant patients with DA were found on induction of anaesthesia. Thus, proper preoperative airway assessment is of utmost importance. Anaesthesiologists still rely on preoperative assessment of numerous anatomic and clinical features for identification of DA. However, none of the commonly used clinical predictors has sensitivity or specificity of 100% [Table 1]. Utilisation of radiology for 'visualisation' of actual bony and soft tissue structures to assist in prediction of DA could thus be of immense help to the anaesthesiologist. This article aims to highlight the radiological assessment of airway utilising various modalities. Roentgenogram is a quick, cheap, and the most easily accessible radiological investigation and forms the backbone of radiological investigations in a resource-limited setting. Airway assessment using X-rays usually utilises lateral views. Airway structures that may be seen are hard and soft palate, vallecula, epiglottis, pyriform sinus, cricoid cartilage, thyroid cartilage, nasopharynx, hypopharynx and oropharynx. A preoperative lateral cervical spine radiograph in the neutral position may help detect trauma, congenital disorders (odontoid hyperplasia), degenerative conditions (cervical spondylosis, rheumatoid arthritis and ankylosing spondylitis) or syndromes (Down's syndrome, neurofibromatosis, osteogenesis imperfecta, Klippel–Feil syndrome) that may be associated with DA. Lateral cervical spine radiographs with head in flexion and extension may be required in certain conditions, for example, atlanto axial subluxation and diabetes mellitus. Also, range of motion may be judged, even though not used routinely for this due to radiation exposure. Frontal or anteroposterior view of neck is useful for detecting any mass, tumours, tracheal compression or deviation, for example, in goitre or mediastinal mass, for detecting subglottic stenosis (e.g., in croup), and postintubation stenosis. Several studies have measured various parameters for predicting DA. White and Kander studied the X-rays of the mandible, upper jaw and cervical spine in lateral, posteroanterior (PA) and submentovertical views. They found that greater posterior depth of the mandible, seen as an absolute value or as a ratio of effective mandibular length, translated into difficult laryngoscopy (DL). Also, a decreased occiput–spinous process of C1 distance and the C1–C2 spinous process gap was associated with DL. Bellhouse and Doré measured 22 distances and 5 ratios of airway structures in lateral radiographs of head and neck and concluded that 33% reduction in atlanto-occipital extension, recessed chin and increased tongue mass was associated with DA. The atlanto-occipital distance <5 mm has also been associated with DA. Atlanto-axial subluxation (defined as distance >3 mm between odontoid process and Atlas More Details with neck in flexed position) occurs due to numerous causes, namely, trauma, neoplasm, rheumatoid arthritis, Down's syndrome, Ehlers–Danlos syndrome and so on. Tenderness over C1–C2 region should warrant radiological confirmation of the condition. Reduced C1–C2 joint space, large anterior osteophytes, ossification of anterior longitudinal ligament and diffuse idiopathic skeletal hyperostosis of cervical spine have been reported in patients with DA. Hyomandibular distance (≥20 cm) and extension angle A (≥38°) (angle formed by two lines subtending from the most anteroinferior point of the upper central incisor tooth to the anteroinferior border of the body of the sixth cervical vertebra and the most anterior aspect of the body of the first cervical vertebra) have also been found to be associated with DA. An electronically measured maxillopharyngeal angle <90° (normal value >100°) corresponds to CL grade 3–4. Relation of mandibular angle and hyoid bone with cervical vertebra, more rostral mandibular angle and more caudal hyoid bone imply increasingly difficult intubation (DI). Calcification of stylohyoid ligament is also associated with DI. Uses most relevant in paediatric population: diagnosis of epiglottitis (thumbprint sign), croup (steeple sign), adenoid hypertrophy, foreign body and retropharyngeal abscess. Multidetector computed tomography (MDCT) with thin-section reconstructions and techniques such as two-dimensional minimum intensity projection and three-dimensional (3D) volume images enables, apart from precise localisation, characterisation of the lesions as well. It acquires overlapping, high-resolution, thin sections of up to 0.5 mm of the whole thorax in a single breath-hold, which enables optimal visualisation of even the smallest airways. CT finds extensive use in delineating airway pathologies in paediatric population with various congenital and developmental anomalies and also with infectious pathologies which amount to DA, for example, midline craniofacial dysraphism (with or without involvement of nose), choanal atresia, turbinate hypertrophy, adenoid hypertrophy, mucopolysaccharidoses and airway anomalies associated with other syndromes (e.g., macroglossia, retro or micrognathia). Nagamine and Kurahashi studied plain and 3D-CT images for planning intubation in patient with Treacher Collins syndrome More Details and found that in patients with laryngeal deviation even bronchoscope-guided intubation through Fastrach® was difficult. Naguib et al. combined CT scan with clinical and radiological airway risk criteria for identification of a working model for prediction of DA in patients with normal airway anatomy. Out of the various parameters measured on CT, they found the distance between the base of tongue and the posterior pharyngeal wall and the angle between epiglottis and tongue to have statistically significant difference for DL. Prasad et al. compared visualisation of airway structures using CT scan and ultrasonography. They measured eight parameters to assess DA– distance to the posterior surface of the tongue at the level of the tip of the soft palate, thickness of the submental region, hyomental distance, thyrohyoid distance, depth of the epiglottis above the hyoid bone, depth of the epiglottis below the hyoid bone, depth of the arytenoid cartilage and fat pad thickness at the thyroid cartilage. They found good correlation among the two modalities except for hyomental distance, depth of epiglottis above hyoid bone and fat pad thickness at thyroid cartilage for which CT was more precise. 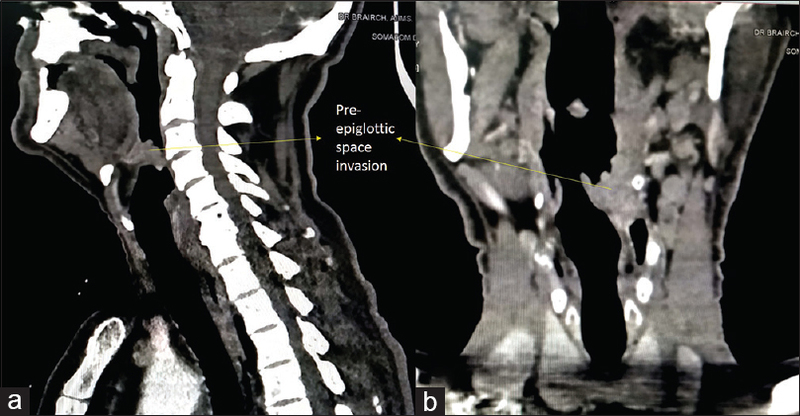 Clinically not assessable preepiglottic and paraglottic space invasion amounting to DA can also be judged using CT scan [Figure 4]. CT scan is also valuable to assess the central airways in patients suffering from diffuse narrowing due to granulomatous infections such as tuberculosis and Wegener's granulomatosis or focal stenosis (as in patients with history of intubation). Preoperative CT scan may help select appropriate size of endotracheal tube and assess the need for tracheostomy. 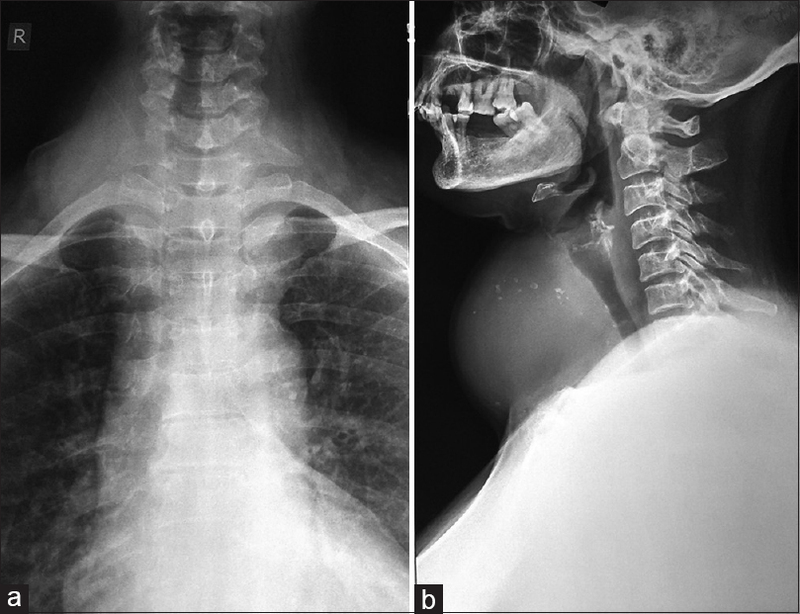 Tracheobronchomalacia (TBM) is largely an underdiagnosed condition mainly because of its dynamic nature which makes its diagnosis on a plain radiograph impossible. It is characterised by airway flaccidity causing excessive dynamic collapse of airway during expiration. It may occur due to prolonged intubation, prolonged tracheal compression, trauma, infections or chronic obstructive pulmonary disease. Even pulmonary function testing is not diagnostic of TBM. MDCT scan can help in accurate diagnosis if gold standard modality – the bronchoscopy – is not available. A reduction of greater than 50%–70% in the area of tracheal or bronchial lumen and 'frown sign' on CT may indicate TBM. Its diagnosis is especially important for planning extubation strategy. Saber-sheath trachea, a term first coined by Greene and Lechner, is a condition characterised by reduced coronal and increased sagittal diameter of intrathoracic trachea in the ratio of 1:2. It may be associated with DA and difficult ventilation through single-lumen tubes or DLTs. Saber-sheath trachea is difficult to diagnose on plain radiograph and MDCT is required for its diagnosis. CT scan can also lead to incidental diagnosis of clinically undetectable, asymptomatic, unilateral vocal cord palsy as in cases of commonly encountered neoplasms of thyroid, lung, oesophagus, skull-based lesions or lymphomas. Thus, the imaging done for formulating treatment plan in such patients should be reviewed by the anaesthesiologist. Apart from these airway pathologies, anaesthesiologists come across airway narrowing and deviation due to extrinsic or intrinsic tumours, for example, thyroid carcinoma, oesophageal cancers, tracheal tumours, nodal enlargement and mediastinal tumours. Kawana et al. also immensely benefitted from 3D-CT airway images for intubating two patients with cancer with previous history of oral surgery who had unidentifiable epiglottis and deformed airway. Preoperative CT scan images guided them towards the trachea. Studies have found little correlation of clinical symptoms and signs with the objective measures such as pulmonary function tests and radiological imaging which may be due to marked tracheal narrowing required to produce respiratory symptoms. To exemplify, the case highlighted by Orton et al. showed a patient with supranormal spirometry indices with normal breath sounds and chest radiograph, but the flow volume loop abnormality led to detection of a tracheal mass on CT scan. Studies suggest that tracheal narrowing to <8 mm may be required to enable detection of stenosis on flow–volume loops. Peak expiratory flow is more sensitive to diagnose airway narrowing. A CT scan with dynamic study may be better in quantifying the stenosis as well as invasion and relation of tumour to surrounding structures. Plain X-ray does not correctly estimate the degree of tracheal stenosis, and hence may give false sense of security to the anaesthesiologist when narrowing is underestimated. Kanaya et al. studied airway of the patient using CT scan after they encountered unanticipated DI in a patient with history of thyroidectomy and recommended using 3D-CT for planning airway management in patients with predicted DA. However, anaesthesiologists should be aware of certain limitations of using CT scans. Axial CT images, used alone, may not adequately display complex 3D relationship of airway to surrounding structures and may also underestimate the craniocaudal extent of the lesion. Also, oblique orientation of airways may portray false impressions. Utilisation of multiplanar reconstructions alongside helps overcome this problem and imparts a clearer picture. CT scanning finds use in study of upper airway structures which in turn helps in airway management during anaesthesia. CT scan being a very less time-consuming procedure is preferred to study the airway anatomy in paediatric age group as it can be performed with the child or infant sleeping or under sedation without the use of airway devices. It is also one of the most commonly used modalities for studying both static and dynamic airway anatomy of patients suffering from obstructive sleep apnoea. It also finds use in cases of trauma for diagnosis of laryngeal fractures, epiglottic avulsion or dislocation, soft tissue disruptions, mucosal oedema, and foreign body and formulating plan for airway management. CT images show good air–tissue interface, which helps in accurate determination of airway dimensions. However, accuracy of CT scan measurements reduces in thin-walled airways, small size airways and varies with the reconstruction algorithms and the scanners used. CT scan is a more precise modality for this purpose than X-ray. DLT size is predicted by measuring tracheal and bronchial diameter as well as cricoid ring size., TW is usually measured at the level of seventh cervical vertebra and LMB diameter around 1 cm from carina. Chow et al. found overall positive predictive value for CT scan–guided DLT size prediction to be around 84% and 61% for male and female, respectively. Measurements done on CT are more precise than those obtained with radiograph. Images are reconstructed using data from helical CT to represent CT bronchography (showing external rendition of airways) and virtual bronchoscopy (VB) (touring the airways from inside). VB has been found to be superior to regular CT sections for airway assessment. Studies comparing VB to real bronchoscopy for airway assessment have found both the modalities to be comparable. In comparison to conventional bronchoscopy, a CT bronchoscopy is noninvasive, operator-independent, does not require sedation or general anaesthesia, requires much less time and can be generated by routine CT image sets [Figure 5]. It finds special use in cases where bronchoscopy or laryngoscopy is not possible or contraindicated. Whole tracheobronchial tree can be visualised as per clinician's requirements. Both the forms, combined, enable the evaluation of airway lesion from external and internal aspects. Also, it has ability to show images beyond the stricture which scores over real bronchoscopy in case of highly stenosed lumens. It is nontraumatic and therefore useful in cases of airway evaluation post-tracheal resection or reconstruction. However, there are some limitations associated with its use, such as radiation exposure, inability to be used as a screening tool for premalignant conditions due to nonvisualisation of mucosal changes, difficulty in differentiating mucosal tumours from mucous collections, susceptibility to respiratory variations, poor visualisation beyond subsegmental bronchi due to usual motion artefacts, altered impressions due to airway secretions, presence of blood and poorly aerated segments. Apparent degree of stenosis also gets altered by the differences in air and tissue threshold display settings. Dynamic studies to evaluate dynamic airway pathologies, for example, tracheomalacia, have less sensitivity with VB as static images are used for 3D reconstruction. Magnetic resonance imaging (MRI) does not find widespread use for the purpose of planning airway management. This is because it is a costly, time-consuming diagnostic modality and requires sedation or general anaesthesia in paediatric and claustrophobic adult population, which itself requires proper airway control. Scanning of airway structures is compromised in MRI due to breathing motion artefacts and limited resolution. Also unlike CT scan, the images cannot be reconstructed to form 3D image for better understanding of the patient's airway anatomy. As CT is good for diagnosing bony pathologies, MRI is superior in defining soft-tissue lesions and cartilage invasions, that too without the fear of radiation exposure. It is also better than CT for differentiating tumours from inflammatory states, which finds implications in oncoanaesthesia in patients treated with radiation and chemotherapy. In spite of all this, MRI has some documented uses in airway evaluation. Samra et al. compared several measurements using neck radiograph and MRI between unexpected DI and similar controls. They concluded that they could not validate any parameter sufficient enough to predict DI. Also, they did not find statistically significant difference among the values measured using both modalities. Elongated epiglottis (≥41 mm) and its abnormal angulation on MRI have been found to contribute to DA. MRI has also been used for finding appropriate size of endotracheal tube. Patients suffering from head and neck, thyroid, oesophageal or mediastinal cancers undergo MRI for tumour staging and for surgical planning. This scan can be used to formulate airway plan as well. Invasion of preepiglottic and paraglottic space should alert the anaesthesiologist because clinical examination in these cases may not hint at DA. Tracheobronchial invasion or compression by thyroid, oesophageal or mediastinal masses may be detected by MRI scan and hence aid in airway planning. Dynamic MR studies may help in identification of uncommon causes of stridor, for example, hypermobile epiglottis, which may also hinder airway management. Thus, even though MRI is not the preferred modality for pure airway evaluation, it can be easily used for understanding the pathophysiology of a patient's airway, especially if it has been done for aiding treatment, like in cases of cervical spine surgeries where it is usually done for formulation of surgical plan. This requires effective communication between the treating doctor, radiologist and the anaesthesiologist. 3D printing is a revolutionary technology which has been utilised for simulation of a patient's airway. This technology, though not commonly available, finds extensive applications for understanding and planning for complex medical cases, namely, congenital airway abnormalities, trauma cases involving airway, cases with head and neck malignancies and so on. It involves 3D models printed according to image data acquired from CT scans. Not many studies have been conducted in this field. Han et al. claim to have put this technique to use for the first time for airway management of a postlaryngectomy patient posted for pelvic surgery. They found it immensely useful for formulation of their preanaesthetic plan and for deciding proper tracheostomy tube size and position. A review article by Chao et al. throws light on its vast applications in anaesthesia training, planning and management. A limitation of this modality is that the models created are rigid and do not simulate flexibility of tissues. Ultrasound is gaining increasing use in the hands of the anaesthesiologists for varied purposes. Airway examination uses two techniques – the transoral or sublingual approach and the most commonly used transcutaneous approach. Ultrasound is used for identification of cricothyroid membrane and facilitation of percutaneous dilational tracheostomy, prediction of DI, appropriate endotracheal tube or DLT size, predicting postextubation stridor, detection of laryngeal mask airway position and identification of vocal cord dysfunctions.,, It also finds use in confirmation of endotracheal intubation, especially so in conditions where capnography is not of much help, namely, severe bronchospasm, cardiopulmonary arrest and pulmonary embolism. In spite of varied spectrum of applications of this modality, it has slow evolution, especially in developing and underdeveloped countries because of its limitations. These include it being operator-dependent, requirement of expertise to delineate sonographic anatomy from acoustic artefacts and thus more time and training to master the technique and requirement of a costly equipment. 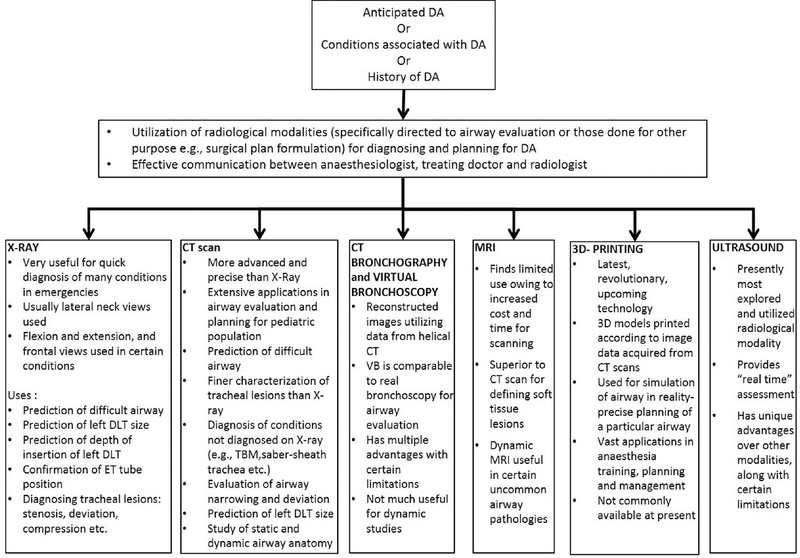 The various modalities for radiological evaluation of airway have been summarised in [Figure 6]. The search for perfect radiological parameters to predict DA is still on. There is no single modality and parameter which is infallible. Basic knowledge of radiology among anaesthesiologists along with co-ordination between radiologist and anaesthesiologist would reduce morbidity and mortality arising out of difficulties in airway management. The anaesthesiologists should utilise, whenever possible, imaging done for other purposes, for example, for surgical staging and planning, to formulate effective airway management plans. Peterson GN, Domino KB, Caplan RA, Posner KL, Lee LA, Cheney FW. Management of the difficult airway: A closed claims analysis. Anesthesiology 2005;103:33-9. Roth D, Pace NL, Lee A, Hovhannisyan K, Warenits AM, Arrich J, et al. Airway physical examination tests for detection of difficult airway management in apparently normal adult patients. Cochrane Database Syst Rev 2018;5:CD008874. Han YZ, Tian Y, Zhang H, Zhao YQ, Xu M, Guo XY. Radiologic indicators for prediction of difficult laryngoscopy in patients with cervical spondylosis. Acta Anaesthesiol Scand 2018;62:474-82. White A, Kander PL. Anatomical factors in difficult direct laryngoscopy. Br J Anaesth 1975;47:468-74. Bellhouse CP, Doré C. Criteria for estimating likelihood of difficulty of endotracheal intubation with the Macintosh laryngoscope. Anaesth Intensive Care 1988;16:329-37. Gupta K, Gupta PK. Assessment of difficult laryngoscopy by electronically measured maxillo-pharyngeal angle on lateral cervical radiograph: A prospective study. Saudi J Anaesth 2010;4:158-62. Gupta S, Sharma KR, Jain D. Airway assessment : Predictors of difficult airway. Indian J Anaesth 2005;49:257. Hiremath AS, Hillman DR, James AL, Noffsinger WJ, Platt PR, Singer SL. Relationship between difficult tracheal intubation and obstructive sleep apnoea. Br J Anaesth 1998;80:606-11. Brodsky JB, Lemmens HJM. Tracheal width and left double-lumen tube size: A formula to estimate left-bronchial width. J Clin Anesth 2005;17:267-70. Russell WJ. A logical approach to the selection and insertion of double-lumen tubes. Curr Opin Anaesthesiol 2008;21:37-40. Chow MY, Liam BL, Thng CH, Chong BK. Predicting the size of a double-lumen endobronchial tube using computed tomographic scan measurements of the left main bronchus diameter. Anesth Analg 1999;88:302-5. Chow MY-H, Goh M-H, Ti L-K. 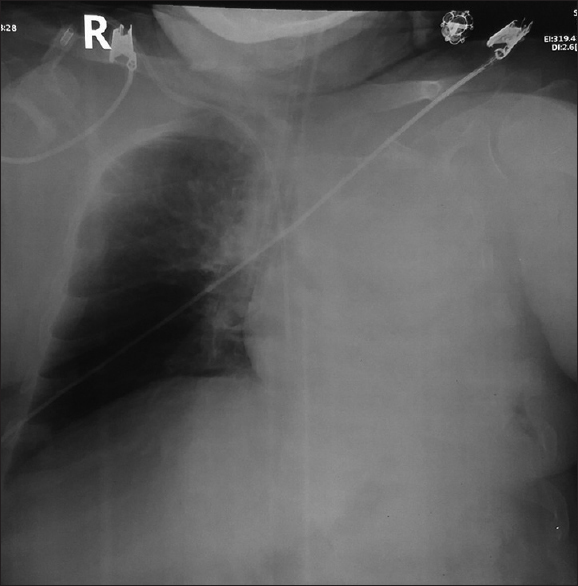 Predicting the depth of insertion of left-sided double-lumen endobronchial tubes. J Cardiothorac Vasc Anesth 2002;16:456-8. 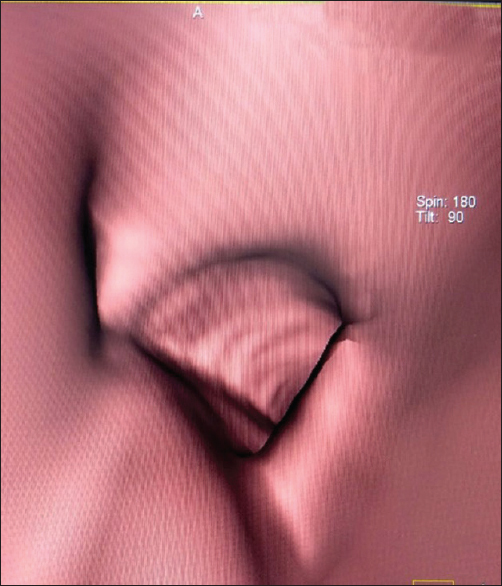 Nagamine Y, Kurahashi K. The use of three-dimensional computed tomography images for anticipated difficult intubation airway evaluation of a patient with Treacher Collins syndrome. Anesth Analg 2007;105:626-8. Naguib M, Malabarey T, AlSatli RA, Al Damegh S, Samarkandi AH. Predictive models for difficult laryngoscopy and intubation. A clinical, radiologic and three-dimensional computer imaging study. Can J Anaesth 1999;46:748-59. Prasad A, Yu E, Wong DT, Karkhanis R, Gullane P, Chan VW. Comparison of sonography and computed tomography as imaging tools for assessment of airway structures. J Ultrasound Med 2011;30:965-72. Lee EY, Litmanovich D, Boiselle PM. Multidetector CT evaluation of tracheobronchomalacia. Radiol Clin 2009;47:261-9. Greene R, Lechner GL. 'Saber-Sheath' trachea: A clinical and functional study of marked coronal narrowing of the intrathoracic trachea. Radiology 1975;115:265-8. Kawana S, Nakabayashi K, Kawashima F, Watanabe H, Namiki A, Hirano T. Difficult intubation assisted by three-dimensional computed tomography imaging of the pharynx and the larynx. Anesthesiology 1995;83:416-9. Orton C, Ward S, Jordan S, Menzies-Gow A, Hull JH. Flow–volume loop: Window to a smooth diagnosis? Thorax 2015;70:302, 304. Al-Qadi MO, Artenstein AW, Braman SS. 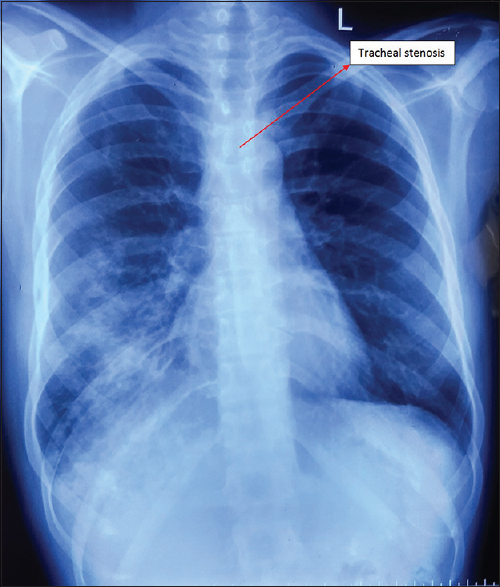 The 'forgotten zone': Acquired disorders of the trachea in adults. Respir Med 2013;107:1301-13. Kanaya N, Kawana S, Watanabe H, Niiyama Y, Niiya T, Nakayama M, et al. The utility of three-dimensional computed tomography in unanticipated difficult endotracheal intubation. Anesth Analg 2000;91:752-4. Chen H, Aarab G, de Ruiter MHT, de Lange J, Lobbezoo F, van der Stelt PF. Three-dimensional imaging of the upper airway anatomy in obstructive sleep apnea: A systematic review. Sleep Med 2016;21:19-27. Oguma T, Hirai T, Niimi A, Matsumoto H, Muro S, Shigematsu M, et al. Limitations of airway dimension measurement on images obtained using multi-detector row computed tomography. PLoS One 2013;8:e76381. Shiqing L, Wenxu Q, Jin Z, Youjing D. The combination of diameters of cricoid ring and left main bronchus for selecting the 'best fit' double-lumen tube. J Cardiothorac Vasc Anesth 2018;32:869-76. Finkelstein SE, Schrump DS, Nguyen DM, Hewitt SM, Kunst TF, Summers RM. Comparative evaluation of super high-resolution CT scan and virtual bronchoscopy for the detection of tracheobronchial malignancies. Chest 2003;124:1834-40. Ahmad I, Millhoff B, John M, Andi K, Oakley R. Virtual endoscopy—a new assessment tool in difficult airway management. J Clin Anesth 2015;27:508-13. Das KM, Lababidi H, Al Dandan S, Raja S, Sakkijha H, Al Zoum M, et al. Computed tomography virtual bronchoscopy: Normal variants, pitfalls, and spectrum of common and rare pathology. Can Assoc Radiol J 2015;66:58-70. Samra SK, Schork MA, Guinto FC. A study of radiologic imaging techniques and airway grading to predict a difficult endotracheal intubation. J Clin Anesth 1995;7:373-9. Al-Mazrou KA, Abdullah KM, Ansari RA, Abdelmeguid ME, Turkistani A. Comparison of the outer diameter of the 'best-fit' endotracheal tube with MRI-measured airway diameter at the cricoid level. Eur J Anaesthesiol 2009;26:736-9. Banko B, Djukic V, Milovanovic J, Kovac J, Novakovic Z, Maksimovic R. MRI in evaluation of neoplastic invasion into preepiglottic and paraglottic space. Auris Nasus Larynx 2014;41:471-4. Breyer T, Echternach M, Arndt S, Richter B, Speck O, Schumacher M, et al. Dynamic magnetic resonance imaging of swallowing and laryngeal motion using parallel imaging at 3 T. MagnReson Imaging 2009;27:48-54. Han B, Liu Y, Zhang X, Wang J. Three-dimensional printing as an aid to airway evaluation after tracheotomy in a patient with laryngeal carcinoma. BMC Anesthesiol 2016;16:6. Chao I, Young J, Coles-Black J, Chuen J, Weinberg L, Rachbuch C. The application of three-dimensional printing technology in anaesthesia: Asystematic review. Anaesthesia 2017;72:641-50. Tsui BCH, Hui CMW. Sublingual airway ultrasound imaging. Can J Anaesth 2008;55:790-1. Fulkerson JS, Moore HM, Anderson TS, Lowe RF. Ultrasonography in the preoperative difficult airway assessment. J Clin Monit Comput 2017;31:513-30. Osman A, Sum KM. Role of upper airway ultrasound in airway management. J Intensive Care 2016;4.52. Gottlieb M, Holladay D, Peksa GD. Ultrasonography for the confirmation of endotracheal tube intubation: A systematic review and meta-analysis. Ann Emerg Med 2018;72:627-36.